As I mentioned in my last column, when Sci-Fi Originals pictures hits it, it's to homerun proportions. Conversely, when Sci-Fi Originals misses, they miss by a Grand Canyon-width margin. Happily, Cerberus falls into the former category. For those who have forgotten, or perhaps were never taught, elementary-school Greek mythology, Cerberus was a three-headed dog with the tail of a serpent that was the guardian of the gates of the Underworld, ruled by Hades. Cerberus allowed the dead to pass into the Underworld, but prevented any from escaping; he also prevented the living from having access to the world of the dead. According to myth, few outside of Hades were able to control Cerberus; only Heracles, who subdued the fierce beast and brought him to the upper world in order to complete his Twelfth Labor, and Orpheus, who lulled Cerberus to sleep with a lyre in order to enter Hades and rescue Eurydice, are credited with having any success in handling Cerberus. 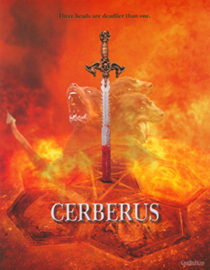 In this film, Cerberus takes on another task, that of protector for Attila the Hun, or more importantly, Attila's legendary weapon, the Sword of Mars (and why a creature from Greek mythology would be involved with an artifact from Roman mythology isn't addressed, so it's best not to dwell on that for too long). According to legend, the sword of the Roman god of war was given to Attila so he would invincible in battle, and that it was buried with him when he died. Since then, Cerberus has stood guard over the sword, killing those unlucky few who stumble across its hiding place and try to remove the sword from its proper resting place, which is clasped tightly between the skeletal hands of the Scourge of God. The only clues to its location are on the breastplate worn by Attila, in the form of characters that are apparently an ancient form of Romanian. Which, naturally, makes the breastplate valuable to more than collectors of antiquities and museums; otherwise, there'd not be much of a story here.